On August 19, 1991, Muscovites awoke to the jarring sight of tank treads on the streets and ballet slippers on the television as a counter-perestroika coup had begun. ­Today, as Russians pause to remember those three days that shook the Soviet Union to its very foundation, a surprising diversity of views about the event and its aftermath are surfacing. Shortly after the failed putsch, which had been carried out with the intention of halting Gorbachev’s perestroika (“restructuring”), many Russians spoke with nostalgia on those exhilarating days; when they stared into the jaws of the Soviet military machine and walked away unscathed. In fact, protesters were shown playing guitars on top of the tanks and sharing cigarettes with the tank crews. Eventually, however, such high-spirited assessments of those daring days of August were dashed by a more realistic reading of the situation. Although many Russians willingly risked their lives for the sake of Mikhail Gorbachev's tentative democratic reforms, few could have predicted that the immediate impact of the coup would be the collapse of the Soviet Union four months later. Although it may seem like a contradiction, Muscovites did not take to the streets with the intention of destroying the Soviet Union. Their goal was to simply support the idea of a more open and free system. But the collapse of the entire Soviet Union is what they got. And this was just the start of an avalanche that would go on to obliterate everything in its path. When the Soviet Union gave up the ghost, it had disintegrated into 15 separate entities; a loose mass of chaos across some of the most sensitive geopolitical real estate on the planet. And as Georgia's act of aggression in 2008 against Russian peacekeepers in South Ossetia proved, chaos in Russia's "near abroad" will not go away anytime soon. Here is one description of the bleak situation that confronted the Russian Federation and the former Soviet republics just two years after the Soviet Union suddenly convulsed and died: “The break in economic and cultural ties between the former Soviet republics has been accompanied by wars, terrorism, increased crime, hunger, unemployment, hyperinflation, primitive nationalism, chauvinism, extremism and separatism – and this is only the beginning. 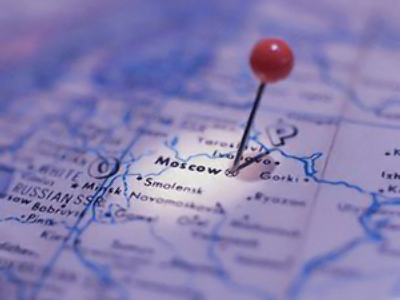 In Russia, Ukraine and some Central Asian states, the mortality rate now surpasses the birth rate,” BAS reported. This seems to be what Prime Minister Vladimir Putin had in mind when he described the collapse of the Soviet Union as the “greatest geopolitical catastrophe of the century.” With nationalism, extremism and terrorism on the rise, and the national birth rate in the basement, it should be no surprise that an increasing number of Russians are starting to come around to the same opinion. The Levada Center, a Russian polling agency, reported this week that the number of Russians who believe that the attempted putsch in August 1991 was “a tragic event that had disastrous consequences for the country and people” increased from 25% to 39% over the past decade. In a recent interview with Der Spiegel, Mikhail Gorbachev supported this assertion, saying that "The [Soviet] Union was destroyed against the will of the people and that was done absolutely deliberately." Gorbachev added that public opinion polls indicate most people express regret over the disintegration of the USSR. Meanwhile, only 9 percent answer 'yes' to the question whether they would support its revival. No explanation has been given for this incongruity of opinion. In light of such findings, it is interesting to imagine how many people would have just stayed in bed on the morning of August 19, 1991 had they known that the entire Soviet Union was on the verge of sliding into the historical abyss. Aleksander Prokhanov, editor-in-chief of the Communist newspaper “Zavtra,” which still enjoys a large readership, explains why he believes the collapse of the Soviet Union was a catastrophe of the first order. Prokhanov then alluded to what he perceives as the near collapse of the educational system, one of the finer attributes of the Soviet system. According to Prokhanov, the tremendous wealth of the country has been absorbed by a mere fraction of the population with disastrous consequences for the country. This brings to mind a popular quote by Viktor Chernomyrdin, former Russian prime minister under Yeltsin: “We wanted the best, but it turned out as always." Not everybody, however, is so downbeat on what the Soviet coup and the concomitant collapse of the Soviet Union means for the future of Russia. Konstantin von Eggert, a commentator and host of Kommersant FM radio in Moscow, witnessed those three days of August with unconcealed enthusiasm, which has not subsided today. 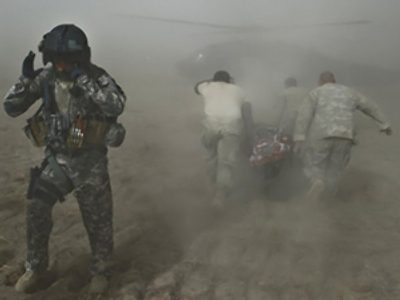 I remember one lieutenant sitting on a tank telling me: "Do not worry. We will not shoot at the people!" These were days of solidarity and idealism that are unforgettable, he added. For the majority of Russian people, however, the greatest challenge they faced following the collapse of the Soviet Union was adjusting themselves to a radical new socio-economic system that few people were prepared for. The overnight switch from a planned economy to a free market economy was no easy transition. Indeed, it was nothing short of hell. ­The first surprise coming on the heels of the failed Soviet coup of August 1991 was the collapse of the Soviet Union and its disintegration into 15 separate entities. The second surprise was the introduction of a form of capitalism that would have repulsed even the most world-weary western businessman. 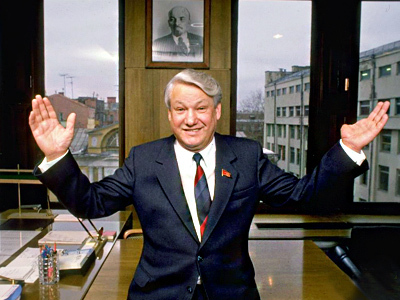 The newly declared Russian Federation, under its first president Boris Yeltsin, quickly succumbed to what has been described as “gangster capitalism” as a handful of individuals squared off against each other in a battle to control the country’s beleaguered industries. Contract killings carried out in broad daylight became a regular feature of Russia’s harsh post-communist landscape. 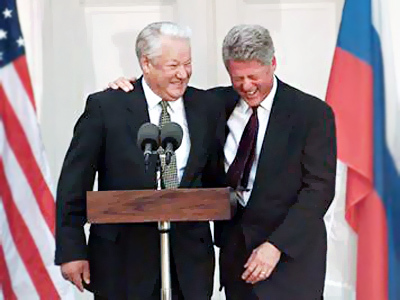 Yeltsin, however, was confronted with more than just the problem of revitalizing the Russian economy. During his 9-year term in office, Russia faced a series of challenges, which included soaring inflation, the opening of the Chechen War (1994), the crash of the ruble (1998), and NATO’s attack on Yugoslavia (1999). Needless to say, the Russian people were desperately hoping for some certainty in their lives at this point. 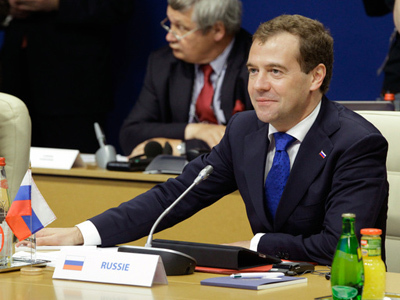 Today, Russia continues to distance itself from the transgressions of the 1990s as President Dmitry Medvedev advances his ambitious reform initiatives, which includes battling entrenched corruption, as well as what has been labeled “legal nihilism,” a certain cultural trait that is strongly rooted in the Soviet era. On a crucial side note, much has already been written about what role Mikhail Gorbachev played – and didn’t play – in the moments leading up to and including the failed Soviet coup. He has been accused of everything from being a co-conspirator in the failed putsch, to failing to address the assembled crowd at the White House when he finally returned to the Russian capital. In reality, however, it may have been the case that Gorbachev simply lacked an effective PR machine to properly address the turmoil as it unfolded. In the Der Spiegel article, which cites “previously unknown documents,” it is said that Gorbachev “shocked his jubilant fellow Russians” by his rather timid and indecisive actions during the climatic moment of the coup. Clearly, the moment called for something more than a business-as-usual attitude to events that had the potential of dragging Russia back into the Middle Ages. 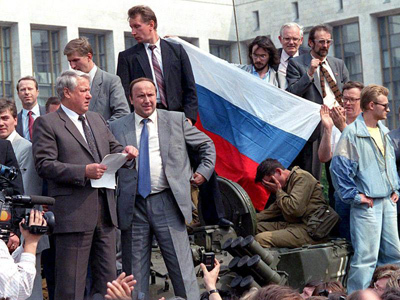 At this moment, Gorbachev immediately fell out of favor with the people, and this cleared the path for the rise of Boris Yeltsin, whose gutsy speech on top of a tank in front of the White House was exactly the gesture the historical moment demanded. ­There is another interesting aspect to consider about those tense 72 hours in August 1991. In light of the recent looting of London, the events in the center of Moscow 20 years ago were relatively peaceful and almost prosaic. Despite the palpable tension on the streets, and everything that was at stake, the Russian capital did not succumb to a mob mentality or resort to mindless looting. Moscow did not burn. This is all the more incredible when it is remembered that the Soviet Union was experiencing an acute economic crisis at the time of the failed putsch. The Soviet people, resourceful survivalists after years of enduring shortages, were very much aware that it might be days before they would be able to buy food. Despite this very real threat, incidences of public disorder were exceedingly rare. As the entire world is now traveling down the road of material progress, it seems we have forgotten the need for respectable art and culture, Babich noted. When the people lack positive influences they will imitate whatever it is they are most familiar with, and today that seems to be productions appealing to the lowest common denominator. 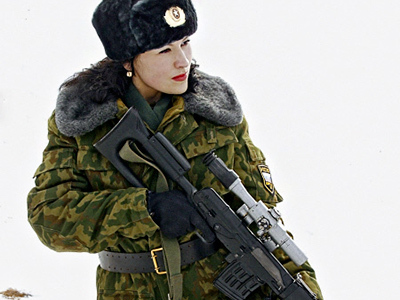 ­Speaking about the breakdown of traditional social mores and values, which recently manifested itself on the streets of London, brings to mind the elusive notion of the “Russian Soul,” a concept that only Russians seem able to comprehend. Perhaps it is not even something that is comprehended, but rather just taken for granted. Whatever the case may be, it is worth briefly mentioning this concept because it may have been the “Russian soul” that got the Russian people through the 70-year experiment with communism, not to mention the tumultuous 1990s. The Russian soul may also have been what permitted communism to take root on Russian soil in the first place. According to Professor Marian Broda of the University of Lodz, Russians are on a “quest for absolute values, the good without any taint of evil.” This would be a good description of communist theory, which was in search of an absolute historical “good” that only a worldwide workers revolution could deliver. When the Bolsheviks seized control of Russia in 1917, much of the western world was suffering under the boot of rapacious “robber barons,” industrialists who failed to see the inherent evil of allowing even the youngest children to toil from morning till night inside of “Satanic mills.” Where democratic principles, not to mention Christian teachings failed to emancipate the majority of people, Russian-style communism readily stepped in to fill the void. Although the dream of building a “workers’ paradise” failed to materialize, it still speaks volumes about the character of the Russian people, who risked everything to build a world, an earthly utopia, which was free from untold human suffering at the hands of a few repugnant individuals. Thus, it is no surprise that not only did the Russian people come out in defense of democratic principles, but that the streets were practically void of violence. The same thing could be said about the final collapse of the Soviet Union, which went out with a whimper, not the expected bang. These things are important to consider in the modern historical context, especially now that the planet is littered from one end to another with the most destructive weapons ever devised. When the mighty United States, for example, is forced to throw in the towel on its present ideology, and beat a retreat on the global stage, will it also go quietly into the night, without resorting to violence and arms, or will it go out with a tremendous bang? Is there such a thing as an “American soul”, or did crass consumerism and mindless materialism destroy the seeds of such a concept before it ever had time to take root? The Russian people, it seems, are not the only ones who can learn something from the harsh lessons of the Soviet coup and the concomitant collapse of the Soviet dream. Evgeny Sukhoi contributed to this story. To read Nikolay Svanidze's column on the Soviet coup, click here.